Once the capital of Gujarat, Ahmedabad, today, epitomizes one of the most happening cities in India. This bustling metropolis is built on the banks of the Sabarmati River. A blend of old and new, Ahmedabad was founded in 1411 by Sultan Ahmed Shah, after whom the city is named. The place is also associated with Mahatma Gandhi who embarked on his famous Dandi March from here. With a rich history spanning more than 600 years, Ahmedabad, a favourite destination of travellers, is a fascinating blend of the past and present. 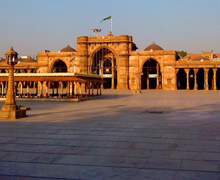 Ahmedabad offers many historical attractions for its visitors like Ahmed Shah's Mosque and Bhadra Fort, museums like Sabarmati Gandhi Ashram and Calico Museum of Textiles. Today Ahmedabad has turned into a choice of global destination. The most famous attraction of Ahmedabad, Sabarmati Ashram was the abode of Mahatma Gandhi from 1917 to 1930 during his fight for Indian independence. Located on the west bank of the Sabarmati River, the ashram became a part of history when in 1930 Gandhi, the tallest figure in India’s struggle for independence, and his 78 companions started his famous salt march to Dandi. Gandhi Smarak Sangrahalaya, where Gandhi’s belongings are on display, is located within the Sabarmati Ashram. A Sound and Light (Son et Lumiere) show depicting the life of Gandhi is held in the evenings at the Sabarmati Ashram. One of the important landmarks of Ahmedabad, Ahmed Shah's Mosque was built in 1411 and shows the influence of Hindu and Jain architecture. Located southwest of Bhadra Fort, this earliest mosque is characterised by an ornately carved ceiling, stunning pillars and jalis. One of the architectural gems of Ahmedabad, Bhadra Fort was built in 1413 by Ahmed Shah. Built in 1423 by Ahmed Shah, the Jama Masjid is one of India’s most beautiful mosques. The mosque is once marked by Jhulta Minar (Shaking Minarets) which were damaged due to the earthquake of 1819. Balvatika, Dada Hari Stepwell, Daria Khan’s Ghummat, Geeta Mandir, Sundarvan Zoo, Hatheesingh Jain Temple, Kankaria Lake, Kochrab Ashram, Rani Rupmati Mosque, Rani Sipri’s Mosque, Science city, Shreyas Folk Art Museum and Sanskar Kendra: (Kite Museum) are other places of interest in Ahmedabad. 19 Km from Ahemdabad and 5 km from the Gujarat capital Gandhinagar, Adalaj Vav is noted for beautifully carved step wells. Set in the tranquil village of Adalaj, these stepwells are popular attractions near Ahemdabad. 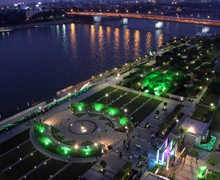 25 km Ahmedabad, Gandhinagar, the capital of Gujarat, is one of the most beautiful cities in India. Situated on the banks of Sabarmati River, Gandhinagar is home to Akshardham Temple dedicated to Lord Swaminarayan. Located 80 km north of Ahemdabad, Lothal is an archaeological site dating back to the Harappan period. An important trading station during the Harappan times, this port city was related to the maritime activities of the inhabitants of the Indus valley civilisation, also known as Harappan civilisation. During the excavations a brick dockyard connected to the Gulf of Cambay by a channel has been discovered here. That the rice was the food of the Harappan people can be gauged from the traces of cultivation of rice found at Lothal. That the worship of fire was prevalent in Harappan period is proved by the discovery of fire altars at Lothal. Located at a distance of 67 km from Ahmedabad, the wetland of Nalsarovar is home to more than 210 species of birds. Set in the midst of a beautiful landscape, the lake of Nal Sarovar covers an area of 116 sq km and is a haven for migratory birds. Prominent among the migratory birds that can be commonly spotted here are Rosy Pelicans, White Storks, Flamingoes, Herons and Brahminy Ducks. Visited by thousands of people every year, the Nalsarovar Bird Sanctuary occupies an area of 12,000 hectares. Being located close to Ahmedabad makes the Nal Sarovar Bird Sanctuary a much sought getaway for the birdwatchers. 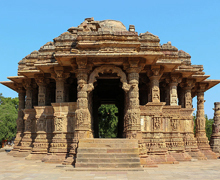 106 km northwest of Ahmedabad, Modhera is top destination for the tourist. Modhera’s claim to fame lies in its being one of the three places where temples dedicated to the Sun God ‘Surya’ are located in India. Built in 1026 and 1027 by the Solanki ruler Bhimdev I, this is the finest specimen of the Solanki dynasty. The fifty two sculpted pillars of the Modhera Sun temple depict scenes from the Mahabharata and the Ramayana. It was during the reign of Bhimdev I (1022-1064) that Mahmud plundered the great temple of Somnath. 133 km northwest of Ahmedabad, Patan is a historical place which was once the seat of power for centuries. Patan is a famous for its Patola silk textiles. Ran-ki vav, an intricately carved step well built in 1063 by Rani Udayamati , consort of Bhimdev I, is a top attraction in Patan. The largest of the 100 Jain temples in Patan, Panchasara Parshvanath is a visual treat. 108 km from Ahmedabad, Vadnagar is an ancient place which finds mentions in the accounts of the famous Chinese pilgrim Hieu-en-Tsang who came to India in the seventh century AD. . Tana Riri garden, Hakteshwar Mahadev temple and Kirti Toran are the places of interest in Vadnagar. Water World Resort and Mehsana are some of the popular excursion sites from Ahmedabad which are located within a radius of 100 km from the latter. By Air: The city’s airport is connected by flights with important cities in India. By Rail: Ahmedabad is a railway station and an important junction on the Western Railway connected with major cities and places in India. By Road: Ahmedabad is connected by good motorable roads to all important ciites and places in India. Some of the nearby cities and places in Gujarat connected with Ahmedabad are Gandhinagar (25 km), Bhavnagar (203 km), Rajkot (216 km), Surat (267km), Jamnagar (304 km), Bhuj (402 km) and Dwarka (450 km). Mumbai is 545 km from Ahmedabad. Whether one is traveling for pleasure or business, a wide variety of hotels are available to meet the needs of everyone. 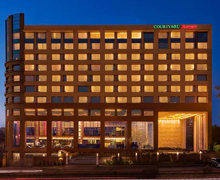 Hotel Le Meridien, Fortune Landmark, Inder Residency, Gateway Hotel Ummed, Hotel Cama, otel Metropole , Hotel Kanak, Comfort Inn Sunset, Hotel Nalanda, Hotel Nest, Comfort Inn, Hotel Royal Highness, Hotel Ritz Inn, The Westend, Sarovar Portico, The Grand Bhagwati, Hotel Ginger, The Lemon Tree Hotel, Hotel Naeeka, Ambassador Hotel, Hotel Quality Inn, Hotel Silver Cloud, Lords Plaza, Hotel Klassic Gold, Silver Oak Hotel & Resort, Hotel Crown, Hotel Golden Plaza, Hotel Centra, Hotel Mascot, Hotel Cadilac, Hotel Capri, Hotel Comfort, Hotel Dimple International, Hotel Embassy, Hotel Excel, Hotel Kingsway, Hotel Meghdoot, Hotel Prime, Hotel Sahil, Hotel Siddartha Palace, Hotel Balwas, Bombay Hotel, Cambay Safire, Airport Residency, Rock Regency, Hotel Chicago, Hotel Pinnacle, Hotel Moti Mahal and Siddhartha Palace are some of the accommodation facilities in Ahmedabad.